Okay, I agree…no fun if you are at the beach and it is raining cats and dogs….the kids are driving you insane….and why did we choose this week? It happens at times, so you will have to make the best of it. And, please, do not go back to your rental agent and start complaining…..it’s raining, and it is only the weather’s fault. With that in mind what could you do besides, shopping and eating? Read on. PLAYLAND ARCADE – Located on the South side of the Boardwalk. 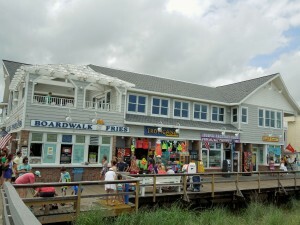 SURFSIDE ARCADE – Located on the South side of the Boardwalk. 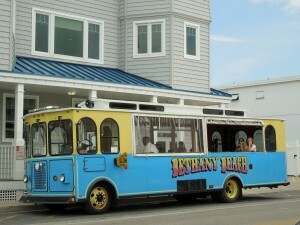 JOLLY TROLLEY – Hop on the Trolley and ride around between Rehoboth Beach and Dewey. Please visit http://www.jollytrolley.com for their services. 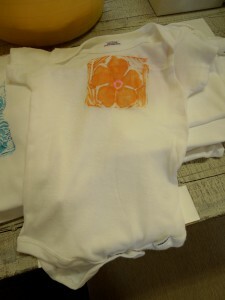 CAKE BREAK – Located at 7 South First St. Decorate a cake and eat it too!! Tel. 302-260-9265. Website? 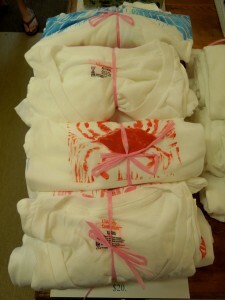 http://www.cakebreakrehoboth.com. Please note that Cake Break is a peanut free facility so if you have someone in your group with a peanut allergy, they will be just fine. They also offer gluten free and vegan cupcakes. BROWSEABOUT BOOKS – Located at 133 Rehoboth Avenue. Tel. 302-226-2665 Website? http://www.browseaboutbooks.com. You can check the books and even sit on one of their comfortable sofas to relax and read awhile. 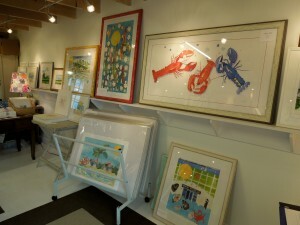 ANNA HAZZARD MUSEUM – Located at 17 Christian St.
REHOBOTH BEACH MUSEUM – Located 511 Rehoboth Avenue, by the roundabout and next to the Visitor’s Center. Website? 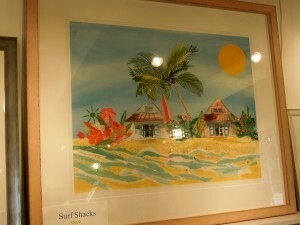 http://www.rehobhtbeachmuseum.org. Their newest exhibit, Beach Eats!! is great. Free admission. 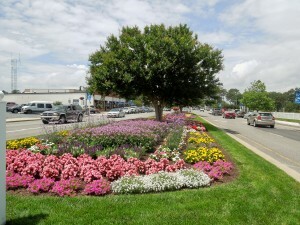 ATLANTIC THEATERS – Located on Coastal Highway at the Midway Shopping Center, between Rehoboth Beach and Lewes. 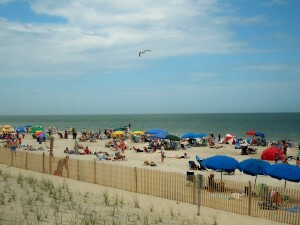 Check the schedule by visiting http://www.moviefone.com/theater/movies-at-midway-rehoboth-beach/3587/s. ZWAANENDAEL MUSEUM – Located on Savannah Rd. and Kings Highway. 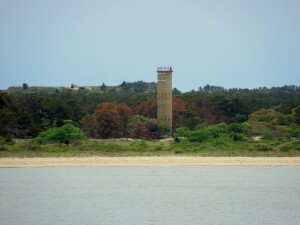 SEASIDE NATURE CENTER – Located at the Cape Henlopen State Park on 15099 Cape Henlopen Drive. Exhibits, displays, including their 1,000 galon tank with local fish, and a touch tank also. Tel. 304-645-6852. Admission to the park is in effect. 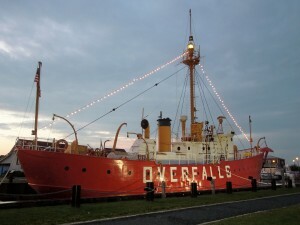 CANNONBALL HOUSE MARINE MUSEUM – Located on Front Street in Lewes. 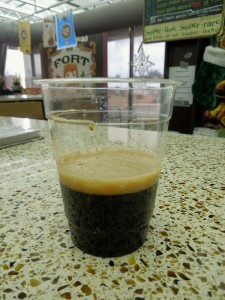 DOGFISH HEAD BREWERY TOURS – The brewery is located in the town of Milton. It is a great tour for adults. Tel. 302-684-1000. Website? 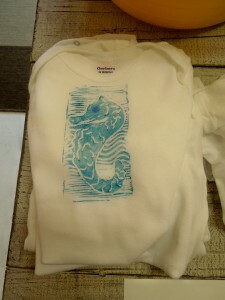 http://www.dogfish.com. Cheers!! Roll with the punches…have a good one! 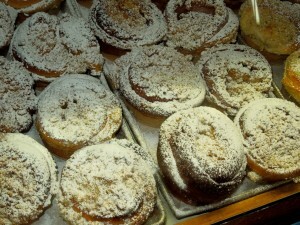 It’s Sunday morning in Rehoboth Beach and the bakeries are open. Delicious baked goods with all of them having their own specialties…so check them out, grab a coffee and make one or all your favorite. 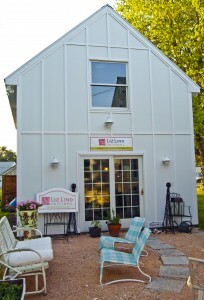 THE POINT – Located at 722 Rehoboth Avenue as you are coming into Rehoboth from Coastal Highway. Tel. 302-260-9734. 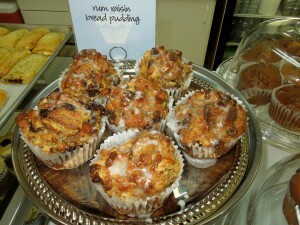 Besides mouthwatering baked goods, they also offer breakfast and coffee. 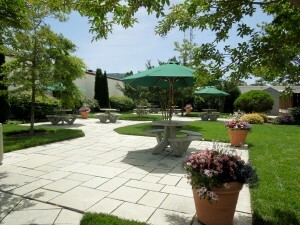 PASQUALINI’S – Located at 375 Atlantic Avenue, behind Crystal Restaurant. 302-227-2111. Please note that Pasqualini’s is under construction, so they are working hard to get the storefront open. You can still call their number for baked goods and then pick them up. So, they are still baking away. 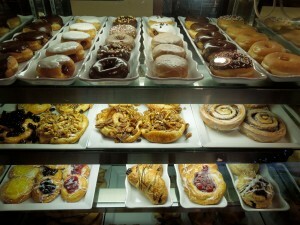 CAKE BREAK – Located at 7 South First St. Tel. 302-260-9264. They are always open. A peanut free facility. Delicious cupcakes and baked goods. They offer gluten free and vegan cupcakes. Website? 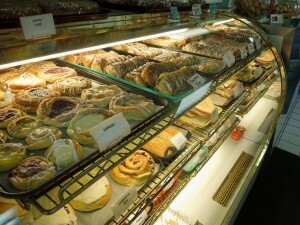 http://www.cakebrearehoboth.com. Last year, it was a first in Delaware when T.S. Smith & Sons, the oldest commercial apple orchard and the only one in Sussex County, teamed up with an award-winning small batch winery, Great Shoals Winery, to first offer Black Twig, Hard Apple Cider. 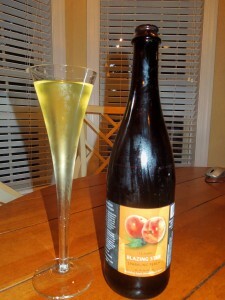 Then, just some months ago the unveiling of the First Hard Peach Cider, Blazing Star came on the market. I went looking for these hard ciders because on these hot summer days…they are so refreshing and just right. 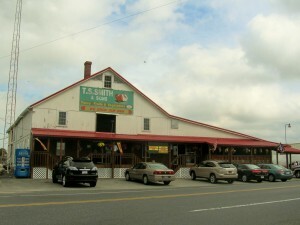 T. S. Smith and Sons is located on Redden Rd. in Bridgeville, Delaware. 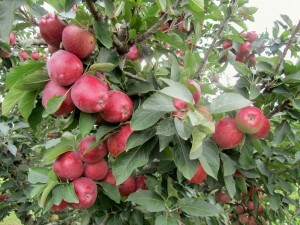 I visited this farm some time ago and you can check my post on 9/23/11 on this website. Apple cider is as much a part of America’s apple story as apple pie. In the Colonial period and up to the middle of the 19th century, cider was the most popular and important beverage in America. T.S. Smith & Sons in Bridgeville frequently fields questions from customer about how to get the “hard” variety of their special drink. Unfortunately, no one in Delaware had produced a hard version of the apple cider. Just a short distance away, south, on Rt. 13, in Princess Anne, Maryland, Great Shoals Winery had completed production of what is now an award winning sparkling hard cider from the Spencerville Red apple, grown on one of Maryland’s historic family farms. Great Shoals Wine Maker, Matt Cimino, was looking for a Delaware Apple with just the right properties for another small batch wine at about the same time T.S. Smith and sons was loking for just the right winery to answer to their customers’ requests for a hard cider. 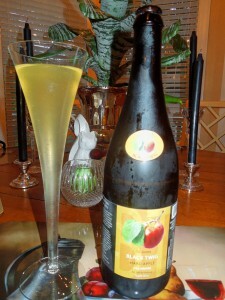 The Black Twig was the chosen apple and last year the Black Twig Hard Apple Cider was presented to the public. The Black Twig apple variety was first grown near Fayetteville, Tennessee during the 1830s. The Black Twig Hard Apple is crisp and dry. It has been awarded the 2012 Winemasters’ Choice Silver Medal. Just a few months ago, a peach hard cider came into the market Again, T.S. Smith and Sons and Great Shoals Winery partnered. This particular cider is a little less dry and bubbly than the Black Twig. 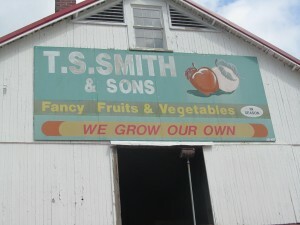 It is made from peaches, Blazing Star, and apples, Ginger Gold, grown at T.S Smith and Sons farm. 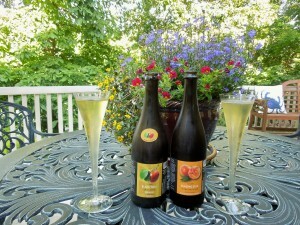 These hard ciders are becoming the perfect drink during the sizzling summer days at the Delaware Beaches. Plenty of the liquor stores in the area are carrying them this summer. And, you can also find them in some of the area restaurants. Please visit Great Shoals Winery at http://www.greatshoals.com for more information regarding their location and where to get their hard ciders and sparkling wines. T.S. Smith and Sons is open year round…Website? 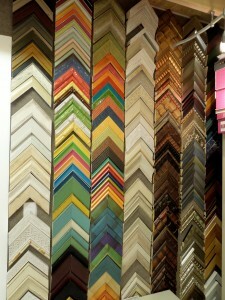 http://www.tssmithandsons.com. Delaware Beaches, They Eat Dessert! !, Guilt Free!! Peanut Butter Pie…Yum! Not only a Winner, but a Keeper! It is that time of the year when friends stop by, families visit because you live at the beach…or you offered to bring dessert to a gathering. I think this one is not only a winner, but a keeper!! It’s the best combination; peanut butter and chocolate. The group is following a low fat diet. It has been said that eating a diet in high fat, even good fats, it is the root of the havoc caused in our system…..Once a week we got together. We did not know each other. But, just like I mentioned on yesterday’s post, we are now friends. 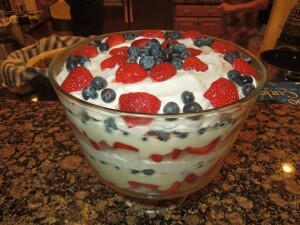 At the pot luck dinner, this dessert, along with the Skinny Strawberry Shortcake Trifle, “No Bake”, was a hit. Completely modified from the recipe found on Allrecipes. It became much lower in fat. And, even though it had Natural Peanut Butter, it was better than the regular peanut butter. Beat together 1 cup peanut butter, cream cheese and Stevia in a medium bowl with an electric mixer on medium. Beat until well combined. Gentley mix in 3 cups whipped topping until thoroughly combined, as well. Spoon mixture into pie shell. Using a spatula, smooth mixture to edges of the pie. Reserve 2 tablespoons of hot fudge topping into the corner of a resealable plastic bag. Microwave remaining topping, on High, for 1 minute. Stir. Spread topping over pie, covering the entire peanut butter layer. Refrigerate until set. Spread remaining whipped topping (1 1/2 cups), over hot fudge layer, being careful not to mix the two layers. Cut a small corner from bag containing topping. Squeeze bag to drizzle topping over pie. Place remaining 2 tablespoons of peanut butter in another resealable food storage bag; cut bag corner and squeeze to drizzle in opposite direction from topping. Refrigerate until ready to serve….Enjoy!! On the left…there it is…the Peanut Butter Pie!! Thanks Stacy!! 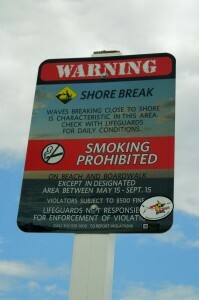 Comments Off on Delaware Beaches, They Eat Dessert! !, Guilt Free!! 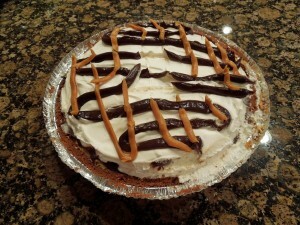 Peanut Butter Pie…Yum! Not only a Winner, but a Keeper! This quote of long ago came to mind when I visited Liz Lind Editions Gallery and Studio in the town of Showell, Maryland. So, you wonder where Showell, Maryland is….It is an unincorporated town in Worcester County not far at all from Ocean City, Maryland and the Delaware/Maryland line, between Bishopville and Ocean Pines, Maryland. 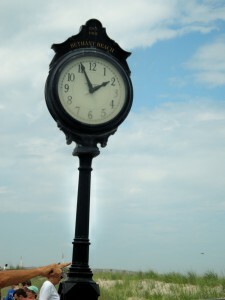 From Rehoboth Beach, Delaware, it will take you about half hour to 45 minutes at this time of the year. 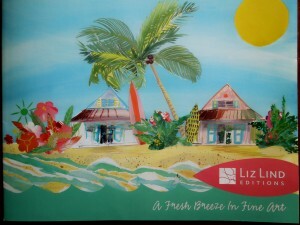 You can find Liz Lind Editions at 10109 Pitts Rd., Showell, MD 21862. Tel. 443-727-9042. Website? 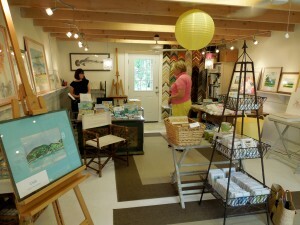 http://www.lizlindeditions.com It opens Saturdays and Sundays from 11 a.m. until 4 p.m. During the week, please call for an appointment and Liz or Erica Rittling, her Assistant, will be happy to receive you. 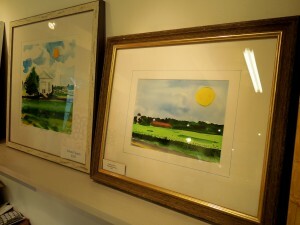 I think that years ago, I stopped at her gallery in Annapolis, and at that time I was taken with her watercolors. 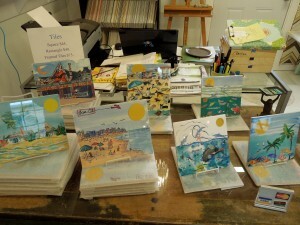 When Liz mentions that sunlight, sand and surf are the 3 elements that inspire her work, all you have to do is look around her studio, or you might want to open her website, above mentioned, to see her work. And, when I looked outside today, it was so pretty that I thought this day is what Liz is talking about…ocean breezes, hot sand between the toes, and pink swirls of cotton candy on the boardwalk. She mentions that those memories are always with her. 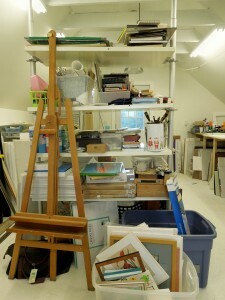 So, I asked her…How did you become a painter? It started as a little girl, buying spiral notebooks from the pharmacy, scribbling and just playing around. 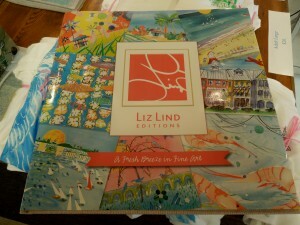 Later in life, she and her mother had a gallery, then Liz had a gallery…and she finally decided that her paintings were selling so well that she would only represent herself…Linz Lind Editions!! 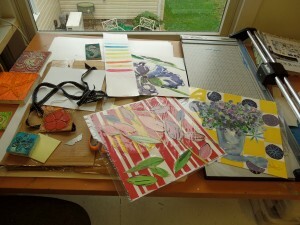 Liz mentions her work is a combination of many things, including gouache. Not knowing what gouache was, I found out that painting in this form is similar to watercolor, but it is modified to make it opaque. 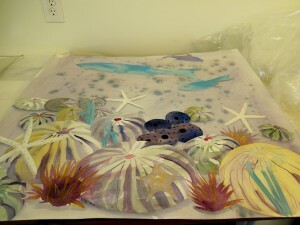 Some of her paintings are traditional watercolors, and she mentions that others are more like a stage set, where they are assembled separately. She works on several paintings at the same time. Some take months; others just minutes. Her work is not complete until the composition becomes her vision. 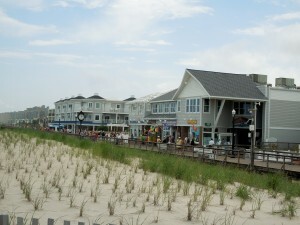 Liz grew spent so much time in Ocean City, Maryland…a coastal type of girl. 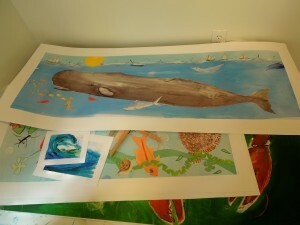 Her paintings show, the sand and the sea, the ocean and surfing, whales, the Atlantic Shore, and the Chesapeake Bay. 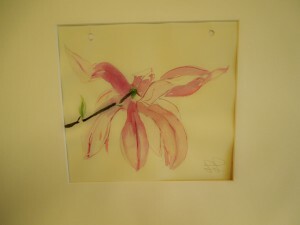 Her watercolors of flowers and garden petals are whimsical…She designed the cover for Maryland Life magazine. 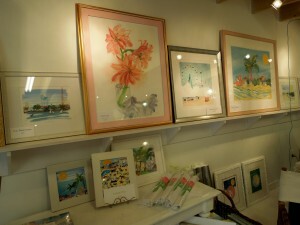 Her gallery is on the first floor and upstairs you will find her studio. 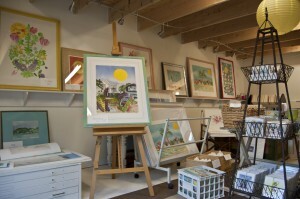 Liz Lind Editions also offers framing. 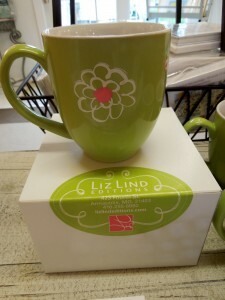 Liz Lind is a brand name. In her gallery you will find the perfect gifts….note cards, ceramic coasters, tiles, framed tiles, baby onesies, coffee mugs, ornaments, and adult and children tee-shirts. 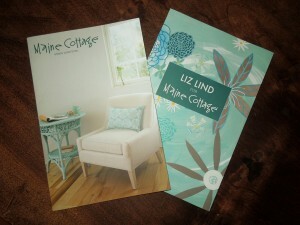 Liz Lind is in collaboration with Maine Cottage. 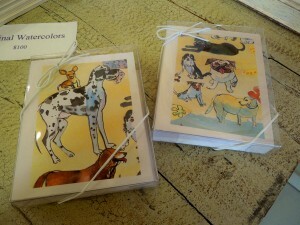 Her works for Maine Cottage are printed and signed in a limited edition of 100. 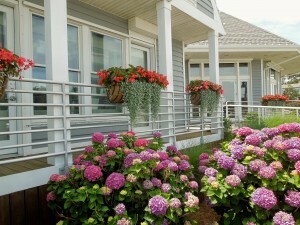 For more information, please visit http://www.mainecottage.com. 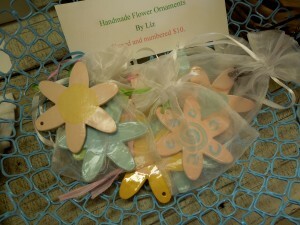 Please note that Liz Lind accepts commission work and she is also a great teacher. If you have any questions, please call her at 443-0727-9042. 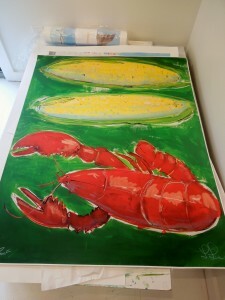 It was so nice meeting Liz….the artist behind her paintings. If you do decide to visit and meet her, you’ll see what I mean. She was friendly, gracious, and fun. And, so were you Erica!! Skinny Strawberry Shortcake Trifle, “No Bake”, Dessert, Light, Low Fat, Ready in Minutes….Delaware Beaches….They Eat Dessert! Guilt Free! Tonight was the night…a graduation of sorts. I think in a post about 16 weeks ago, I might have mentioned that I had committed for 1 year to a program where we were going to be counting fats. NIH did a 5 year, landmark program and that’s what we have been following. I feel so much better…and my doctor agrees. For those 16 weeks, a group of strangers at the beginning…they are now friends. We have met once a week. We have talked and talked and counted fats and rallied for each other. Also, the scale has been used once a week, as well. We all see less of each other.. haha. The program continues for another 8 months, but we will only be meeting once a month. Still continuing with what we have learned…a low fat diet, plenty of exercise, and a good disposition. So, we all got together…and a pot luck dinner took place. But, I guess bad habits are hard to break so, I am starting with dessert. Both desserts, the Trifle and the Peanut Butter Pie, were made to fit our new way of eating. So I’ll start with the Trifle. Pat brought this Trifle and it was truly delicious. It was light, refreshing, easy to make, and low fat. In a large serving bowl or trifle dish, place half the angel food cake pieces on the bottom of bowl. Sprinkle about 2 cups strawberries evenly over the cake. Dollop 1 package of pudding all over top of berries. Sprinkle with 1/2 cup blueberries and drizzle with 1/4 cup strawberry glaze over blueberries. Spread 1/2 container Cool Whip evenly over glaze. Repeat the steps starting with angel food cake and ending with Cool Whip. Decorate top of the Strawberry Shortcake Trifle with remaining sliced strawberries and blueberries. Chill for at least 1 hour before serving. Store any leftovers, if any, covered in the refrigerator. 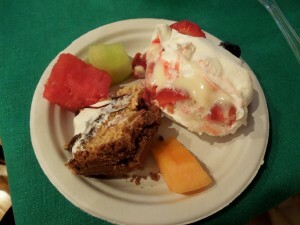 I did enjoy my guilt free desserts…the one on the left is the Peanut Butter Pie!! Note: The recipe was taken Skinny Kitchen. Comments Off on Skinny Strawberry Shortcake Trifle, “No Bake”, Dessert, Light, Low Fat, Ready in Minutes….Delaware Beaches….They Eat Dessert! Guilt Free! New Age, Wine, Argentinian Wine, Outlet Liquors, Liquor Store, Rehoboth Beach, Delaware Beaches…..Perfect for Hot & Steamy Weather!! Cheers! 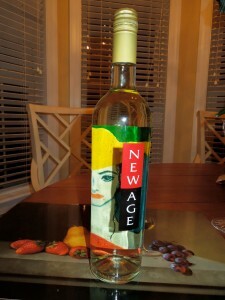 New Age, from Argentina, is a blend of 10% Sauvignon Blanc and 90% Torrontes. It should be enjoyed chilled, by itself, or as a “Tincho”. The “Tincho” is one of the most popular cocktails in Argentina. Pour New Age over crushed ice and and garnish with lime wedges. The intense fruit and floral aromas lead to a soft, sensual wine. Tom is a wine aficionado and he works for Outlet Liquors located at 19724 Coastal Highway in Rehoboth Beach, Delaware. Tel. 302-227-9574. Tom knows wines so well; their history, and he has always been right on the money. New Age is a best seller at Outlet Liquors. And you will not believe the price…$8.99/bottle. The price does not matter with this wine….it is very very good. So, when the weather is hot….Cheers!! Comments Off on New Age, Wine, Argentinian Wine, Outlet Liquors, Liquor Store, Rehoboth Beach, Delaware Beaches…..Perfect for Hot & Steamy Weather!! Cheers! 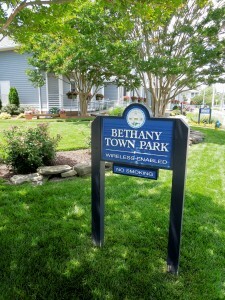 Bethany is quiet during the winter months and residents love it that way. 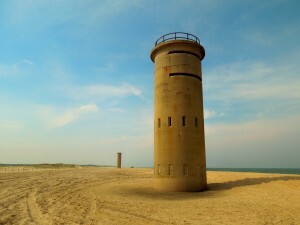 It is a time to recharge and enjoy this beautiful coastal town in Southern Delaware. For many years I was one of those residents. 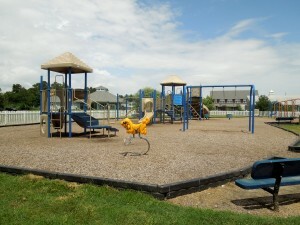 My children’s playground was Bethany Beach. 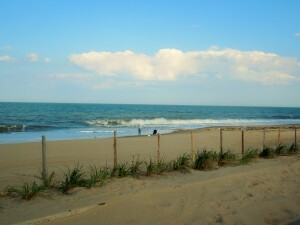 Family Vacation Critic has named Bethany Beach as one of the 10 Best Beaches for Families for 2013. 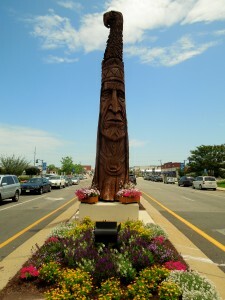 When you arrive in Bethany, “Chief Little Owl” will be welcoming you to the town. The original statue was created by Peter Wolf Toth, who in his own way wanted to give thanks to the U.S. I remember him working on his statue, carving away, for months in the early 1970s. He created more than 50 wooden sculptures of famous Indans and donated at least one to every state. “Chief Little Owl” pays honor to the Nanticoke nation. The first statue stood in that spot until 1992, but was destroyed by high winds. The newest version was created also by Peter Toth, from a red cedar log from the Pacific Northwest which should last from 50 to 150 years. 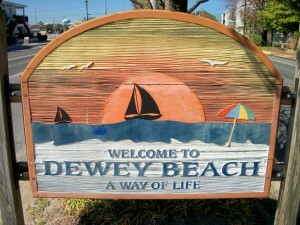 Bethany Beach has a Sister City….Periers, France. Periers is located in the northwest of France just a few miles from the Normandy beaches, on which the allied armies came to the rescue of France on June 6, 1944. The citizens of Periers, who were liberated from German oppression on July 27, 1944 have welcomed American solders and their family members who have visited the town for these many years. On the sign you can see the seal of each town shown linked together by “twinned in friendship”. The sign is located on Garfield Parkway. 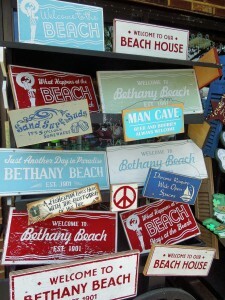 You have to give credit where credit is due….Thanks to Melinda who has beautified the Town of Bethany Beach. Digging, planting, weeding, maintaining, it is a full time job. The town looks awesome! Right by the Totem Pole, at the intersection of Garfield Parkway & Rt. 1, you will find the office for the Town Hall. 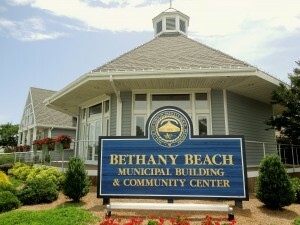 The Bethany Beach History Museum is located in the foyer of the Town Hall. 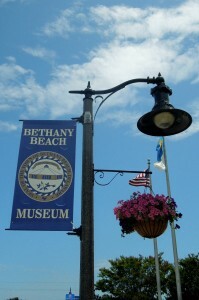 The exhibits contain memorabilia and photographs from the Bethany Beach area. Admission to the Museum is free of charge. It opens weekdays throughout the year from 8 a.m. until 4:30 p.m. During Sundays, in the months of July and August, it will open from Noon until 3 p.m. The Town Park is adjacent to the Town Hall. 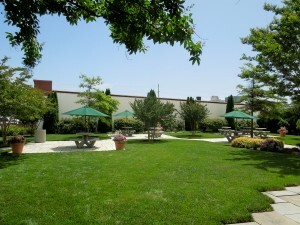 It gets hot at the beach, so this park is the perfect place to take a break; where you can sit, relax, and even work on your computer. It is wireless and it is smoke free. 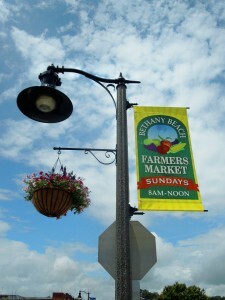 If you are a resident of Bethany or you are vacationing, please note that on Sundays, from 8 a.m. until Noon the Farmers’ Market will be right by the parking lot of the PNC Bank on Garfield Parkway and Atlantic Ave. You cannot miss it, because Garfield Parkway is Main Street. 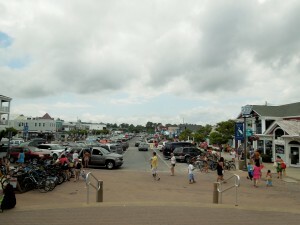 Bethany Beach is a very walkable town because is not very big. You can go from the beach, to shop, eat, relax at the Town Park, or take the kids to the playground, or play basketball, all within a couple of blocks. 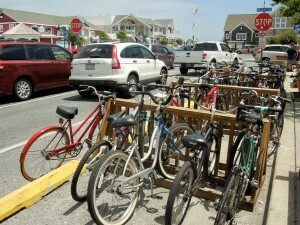 The perfect way to go out and about in Bethany is with your bike. You will find plenty of spaces to park it. But, the Trolley will take you all through town and beyond. It runs from Memorial Day through mid September, continuously, between 9:30 a.m. to 10:00 p.m. Please note that the last pick up on Atantic and Garfield is at 9:45 p.m. On the half hour starting at 9:30 a.m. Please note that during a lunch break or dinner break there may be little or no service daily from 12:30 p.m. to 1:00 p.m. and 7:00 p.m. to 7:30 p.m. You can flag the Trolley down anywhere along the route for pick up or discharge, except on Rt. 26 and Rt. 1. No pick-up or drop-ff on Jefferson Bridge or Rt. 26. With a trolley far of only $.25 each way, you know you cannot beat that. Also, the driver does not make change, so have your quarter ready. 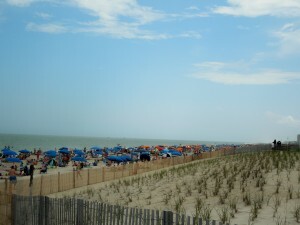 For more info, please call 302-539-8011 or check the schedule by visiting http://www.townofbethanybeach.com/index.zspx?nid=268. 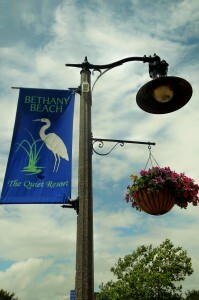 It was great to see Bethany so crowded, because after a quiet winter it was as if it was screaming….Look at Me Now!! Garfield Parkway was full of visitors, and so was the Boardwalk….the beaches? Everywhere you looked the umbrellas were up. 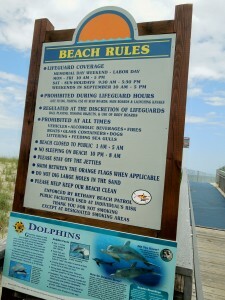 All streets in Downtown Bethany Beach lead to the beach….make sure you read all the beach regulations. The weather for this first official week of the Summer of 2013 continues to be fantastic. It almost makes you forget all the rain we have had lately. 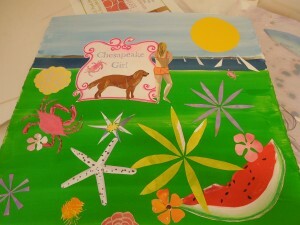 Enjoy the beach, kick back and relax….that’s what you are here for!! Note: Some of the info. 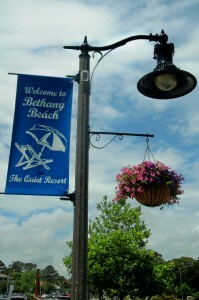 for this post was taken from http://townofbethanybeach.com.